Bronchial asthma is a very common condition connected with the respiratory system and is among the most widespread health problems. A unique wheeze may be noticed throughout the complete cycle of breathing. 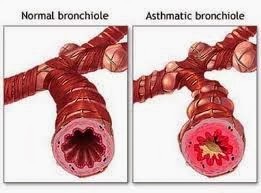 Often the person affected with bronchial asthma will be coughing, not to mention panting, at the time of inhalation due to an uneasy tightening up of the chest muscles. This situation affects men and women a lot all through the night and also in the daytime; hence insomnia is a factor, which usually increases distress. Children with bronchial asthma through an active, rational treatment, the vast majority can be radical. If your child has bronchial asthma, this inflammation of the lungs can cause serious difficulties with breathing and can be a life-threatening condition. The symptoms of bronchial asthma in children are treatable through lifestyle changes and medications and include wheezing, coughing, fatigue and coughing. Children frequently become infected with respiratory viruses such as the flu, common cold or bronchitis, which can trigger symptoms of asthma and asthma attacks. If your child is is allergic to pollen, pet dander, dust or mold, exposure to one of these allergens can trigger an asthma attack. The use of indoor air fresheners, cleaning sprays, perfumes and other household chemicals may cause an attack of bronchial asthma in your child. If you live in an area with environmental pollution from auto traffic, smog, pesticide use or industrial fumes, these pollutants can cause your child to have bronchial asthma. Bronchial asthma in your child may be caused by sudden changes in weather conditions, such as a decrease in barometric pressure, exposure to extremely hot or cold temperatures or very low humidity. Children who were born prematurely are more likely to develop asthma and may also suffer from more frequent and severe symptoms and attacks. 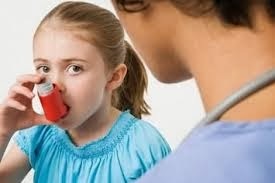 The actual reason for asthma when it comes to young children and older individuals is not known. This problem has been considered to surface if the youngster experiences the common cold, flu, or another breathing dysfunction. Being exposed to dust particles combined with air pollution results in bronchial asthma attacks. There are a few asthma-activators contributing to this problem. Irritants such as dust mites, plant pollen, mildew, physical exercise, chilly air, cigarettes, and specific medicines trigger asthmatic attacks. If the person enduring bronchial asthma is subjected to any one of the mentioned factors, he/she will get an asthma attack. This happens if the air passages become narrow and also the muscle tissues contract. This may lead to swelling of the membranes within the internal walls causing excessive mucus. Due to this problem, a child is likely to inhale and exhale at a really quick pace to help keep the oxygen moving within the air passages. Warning signs of an asthma attack in young children vary from slight to intense. Listed below are regular or moderate bronchial asthma warning signs in toddlers and young children. These particular warning signs experienced during physical exercise are brought on as a result of bronchial asthma. These symptoms seen in young boys and girls tend to be more or less similar to various other types of asthma. Such signs or symptoms surface within just 5 – 10 minutes of beginning to exercise or even while playing! Identifying bronchial asthma in children is difficult due to the immaturity of language and general communication skills in children. A parent should listen for an time period of wheezing or complete inactivity. These are both signs of respiratory problem. Treatment includes aggressive antibiotics and oftentimes steroids are used to stop an attack immediately. Medication includes leukotriene inhibitors, chomolyn sodium, and long-acting bronchodilators. Some of these prevent further attacks while others treat immediate problems. Fast acting inhalers give patients the confidence to go on with daily activities knowing a cure is at their fingertips if the need arises. Understanding an individuals limits concerning the type and level of physical activity is crucial in living a normal life. Another angle of bronchial asthma treatment is to slowly and carefully expose oneself to the suspected allergen in order to build up immunity toward it. This method should be supervised by a doctor due to life threatening effects if something goes wrong. Emergency situations present themselves even in people who have otherwise only experienced mild effects. These characteristics include bluish complexion, rapid pulse, and sweating. Reducing these attacks is the goal of any asthmatic. A diet rich in B5, B6, and B12 vitamins as well as folic acid and vitamin C help build the immune system and the respiratory system in order to avoid such instance. Leafy green vegetable, dairy products, and fish can naturally build up these systems. If other dietary issues need to be taken into consideration, then speaking with a dietitian or nutritionist is advisable. Try to eliminate cockroaches in addition to various other pesky insects. Remain inside the house in case excessive plant pollen content material is discovered in the atmosphere. Quit smoking cigarettes and in addition do not even allow other individuals to smoke a cigarette in your house. Usage of perfumes, air fresheners, and deodorants along with various other fumigations should always be discouraged. Always keep your home as fresh and clean as possible. This will minimize irritants, such as airborne dirt and dust, pollens, animal fur, germs, etc.